Shell Offshore Inc., a subsidiary of Royal Dutch Shell plc, and MOEX North America LLC, a wholly owned subsidiary of Mitsui Oil Exploration Co., Ltd, have each taken the final investment decision to execute phase one of the Kaikias deep-water project in the US Gulf of Mexico. Kaikias is an attractive near-field opportunity with a competitive go-forward break-even price below $40 per barrel. 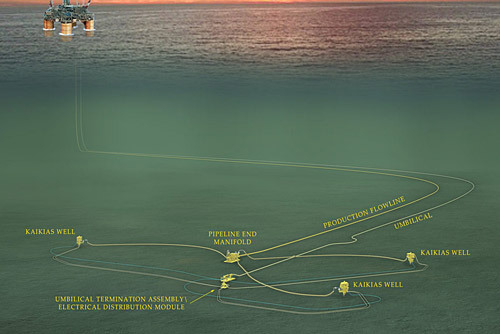 It will produce oil and gas through a subsea tie-back to the nearby Shell-operated Ursa production hub. The project will be developed in two phases with phase one expected to start production in 2019. The first phase of development includes three wells, which are designed to produce up to 40,000 barrels of oil equivalent per day (boe/d) at peak rates. Kaikias is located in the prolific Mars-Ursa basin approximately 210 kilometres (130 miles) from the Louisiana coast and is estimated to contain more than 100 million barrels of oil equivalent recoverable resources. Shell is the operator and has an 80% working interest. MOEX NA owns the remaining 20% working interest. Globally, Shell’s deep-water business is a growth priority for the company and in Q4 2016 produced around 725,000 boe/d. Shell’s deep-water production is expected to increase to more than 900,000 boe/d by 2020 from already discovered, established reservoirs. In the Gulf of Mexico, two other Shell-operated projects are currently under construction or undergoing pre-production commissioning: Coulomb Phase 2 and Appomattox. Tags: itsui Oil Exploration Co. Ltd, MOEX North America LLC, Royal Dutch Shell plc, Shell Offshore Inc.